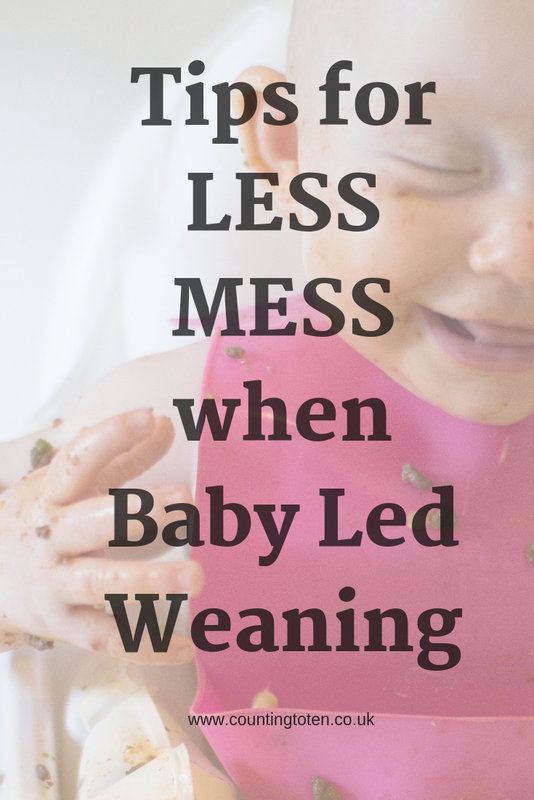 Having been through the baby led weaning process twice now I’ve found a few ways to reduce the mess and making cleaning up as easy as possible. There will still be mess and allowing your baby to explore the food is really important whether it’s through squishing, smearing, dropping or eating, but you can definitely make it less messy. Give your child the chance to make a mess when you have time, but follow my tips for reducing mess for the days you just can’t face all the cleaning. It is very important that during a meal you try and relax about the mess being made and don’t constantly wipe their their hands or clean up after them. Not allowing children to make a mess or get dirty can encourage over compensated cleaning behaviours later on and also cause problems with eating as they may start to avoid certain foods that are considered slimy or messy (Sarah Ockwell-Smith's Gentle Eating book gives some great information about this). Please note post contains affiliate links to Amazon, as an Amazon Affiliate I earn from qualifying purchases without any additional cost to you. There are mealtimes you won’t mind if they need a bath afterwards and some meals where you just need it over with as quickly as possible. Babies seem to love lasagne, spaghetti bolognese and other foods which leave an orange tinge to everything within reach, and that’s ok for the occasional meal, but most of the time you will want a bit less mess. Give your child a variety of food, but below are some suggestions for meals when you want as little mess as possible. When babies are just starting to wean choose foods which are easier to pick up, stick like food which is longer than their hands is great and ideally ones which aren’t too slimy so they don’t go flying when then squeeze their hands too tight shut. Potato wedges (or the occasional unsalted chips), dry toast and apple cut into sticks all work well. It's not just the type of food, but how you cook and serve it that makes a difference: strips of omelette instead of boiled egg and thick, cooled porridge rather than the runnier type are both good options. Foods without sauces are also great to reduce the mess, think a bowl of pasta with maybe cut up pieces of chicken and vegetables, a noodle stir fry (with the noodles broken into shorter than normal pieces or even a roast dinner (minus the gravy). The more dry the food the easier it can be swept up. Dry cereal can make a handy occasional meal and rice dishes can be good when they have good enough coordination to pick it up, my top tip is to leave it a few hours after eating and then it vacuums up nice and easily. If you have carpet under your dining room carpet it’s worth covering it with some plastic or maybe vinyl flooring off cuts for the first few months of baby led weaning, likewise if there is anything fabric (like chairs) within reach of the highchair you will want to think about how you can protect it. If all nearby surfaces can be wiped down and swept it will make cleaning up so much faster. I’ve seen people suggest shower curtains and thin plastic mats work well on the floor and these can be really helpful when away from home (see other tips for eating out when Baby Led Weaning here) but when you are feeding your child 3 plus times a day I think they are too much effort to clean and I would rather just sweep my tiles or put something more rigid on carpet. Clothes will need covering up though (or removing). It’s not just baby's arms and front that can get covered in food, but they will end up sitting on a lot of it too. I started weaning my youngest daughter in the summer so she spent a lot of meal times in just a nappy and bib, messy foods would require a bath afterwards so it could be faster to have her in old clothes that just got shaken out and put in the wash afterwards. I used a lot of bibs like this with long sleeves, but often added a Tommee Tippee Explora Roll 'n' Go bib because they are really easy to clean and the shape of the crumb catcher is great for catching dropped food, my children would even pick dropped bits out to attempt to eat again. Initially I didn’t use any bowls or plates and I found it much easier to just put food directly on the highchair. As foods get more complex they need containing and there are so many great options compared to the first time I baby led weaned 6 plus years ago. Bowls and plates that stick to the highchair are a great choice, but some of them are more effective than others. Sometimes my girls just saw them as a challenge to try to remove and wouldn’t stop trying to pull them off (top tip: try not to let them see you break the suction when removing them, it’s amazing how quickly they learn). My favourite type of these suction plates/ bowls are the ones with a large surface area like EZ PZ mats and Easy Mats. You need to make sure they are the right size for your highchair tray (or that they will stick to your dining room table if not using a tray), but they should stop the plate being used as a frisbee experiences. When children start to use cutlery, plates with a bit of a lip can stop food being pushed straight off the plate. I reviewed this training plate from Oxo Tot last year which is good because the lip can be removed to make it easy to clean. Babies can start using a spoon surprisingly early, and given the chance to practice children that have been baby led weaned will start using cutlery proficiently much earlier than children who are primarily spoon fed. That doesn’t mean you have to give them cutlery at every meal though and inevitably meals with cutlery will initially make more mess than when they just use their hands. There is a growing range of cutlery designed to make it easier for children to feed themselves. I don’t know how big a difference these make, but the child size cutlery and ones that are good for scooping will definitely help make less mess. While babies should be offered a selection of foods I found it best not to put too much food in front of them at once. I would normally have a secondary plate just out of reach that I used to add more to their plate when needed. There are a few reasons for this: the more food there is the more likely they are to accidentally knock it on the floor, they sometimes seem to find too much food in front of them intimidating and will use a great sweeping motion to push it all on the floor, and both girls went through a stage that once they had finished eating they would methodically drop the remaining food on the floor one piece at a time. The less food in their reach, the less they can throw, drop or swipe elsewhere. Your highchair choice is really important when it comes to cleaning up after a baby led weaning meal and I will be writing a dedicated post about this soon, but the key thing is for it to be as simple as possible. The more nooks, cracks and patterns the harder they are to clean. Being able to sit up reasonably independently is one of the indicators that they are ready to start baby led weaning so you shouldn’t need a chair with much padding anyway. The most popular baby led weaning highchair is the Antilop from IKEA because it is great value and very easy to clean with it’s smooth plastic and metal legs. When looking at highchairs look at it all: seat, tray, back, under tray, legs, basically anywhere their hands can reach or food can be dropped onto to see how easy it would be to wipe. Food will get everywhere. The chairs with plastic cushions look more comfortable, but you will find the stitching gets stained and it will take longer to clean. Flannels: I have always had a supply of flannels on hand for cleaning up. Ikea do packs of 10 in the kid's section for a good price and a buying several packs of these has probably saved me a fortune in babywipes over the years. A damp flannel is great for wiping up small bits of food and messes whether on your child, highchair or floor and they can easily be washed on a high heat to make them hygienic for next time. Dustpan and brush: Food will fall on the floor and I found a dustpan and brush the easiest way to clean up. If you don't want to be crawling all over the floor then get one with long handles like this. Anti-bacterial spray cleaner: Babies will eat food off their tray whether you give them a plate or not so a quick spray and wipe with something anti-bacterial is a good idea especially if the tray is plastic. A bucket: If clothes are stained leave them to soak until you have a chance to put a wash on. Napisan can work well for a short soak and if the stain is from organic food (tomato, banana etc) then sunlight will help fade any marks that survive the washing machine. 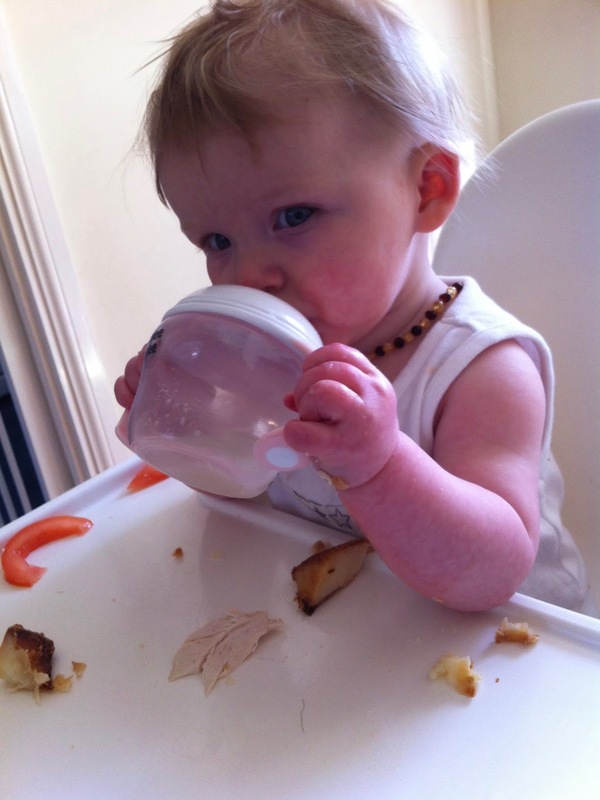 I hope you have as much fun baby led weaning as I have, please feel free to ask me any questions. 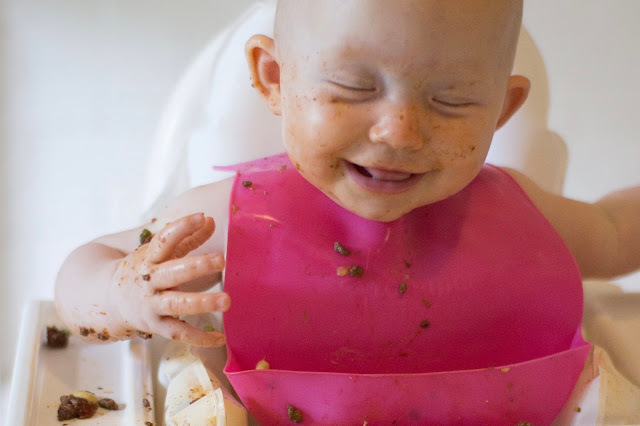 You might find my post on top tips for eating out when baby led weaning helpful and if you have already started the journey you might like my humorous take on What Is Baby Led Weaning. If you want more information about baby led weaning generally, including the science behind it then check out the resources from Gill Rapley and especially her Baby Led Weaning book.